The Grand Opening of our US production facility, the first of its kind outside of Malaysia. When fully operational, this plant will manufacture specialty chemicals predominantly for export into the ASPAC and European market place. The plant is located in New Philadelphia (Ohio) on an area of 3.5 acres, with plenty of space for future expansion. 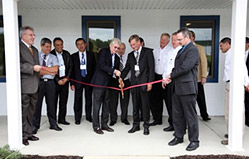 Over sixty guests attended the Grand Opening Ceremony, among them Ohio State Representative Al Landis, Mr. Schoenberg and Mr. Kellinghusen (both shareholder of the Behn Meyer Group), the board of directors of Behn Meyer Specialty Chemicals Holding, as well as the Commissioners of Tuscarawa County. After the flag raising and ribbon cutting ceremony, State Representative Landis welcomed Performance Additives initiative to set up this facility in the State of Ohio and how this benefits the local economy. Mike Wolers, president of the operation, addressed in his remarks some of the reasons for Performance Additives decision on the New Philadelphia location. Besides logistics, he emphasized on the availability of a highly qualified and loyal work force in the region. The ceremony was followed by a tour of the facility and a few hours of socializing.